This post originally appeared on my friend, Amanda Flower’s, blog. I thought it was such a good idea that I’m helping to spread the word! The original publisher of Amanda’s Appleseed Creek Mystery Series decided that it want to go in a different direction that did not include publishing fiction. As a result, they canceled all of their fiction series. Sometimes this happens in publishing. For Amanda it meant the end of her popular Appleseed Creek Mystery Series, which was disappointing. However, she was most worried about the abrupt ending because she left readers hanging at the end of book three, A Plain Disappearance. She wanted to give readers a proper ending about Chloe and Timothy, so she decided to publish A Plain Malice, book four, herself. Since she always considered this novel a gift to her readers, she will donate all royalties for the novel earned through Thanksgiving Day to a food pantry. 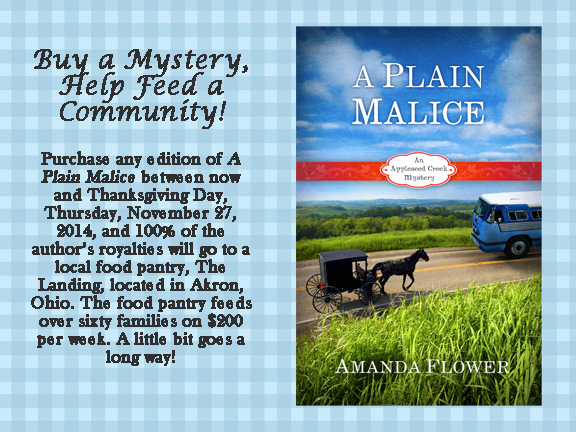 Purchase any edition of A Plain Malice between now and Thursday, November 27, 2014, and 100% of her royalties will go to a local food pantry, The Landing, located in Akron, Ohio. Her brother and sister-in-law, Andrew and Nicole Flower, manage the Landing in the basement of Akron Christian Reformed Church with a group of dedicated volunteers. The food pantry feeds over sixty families in the church’s neighborhood on $200 per week. You can learn more about the Landing in this article and video recently published in the Akronist. So far they have raised nearly $2,000 which is over two months’ worth of food for The Landing. She would love your help in covering at least another month. The paperback edition will release in early December.